Now that I’m gone, I tell you, don’t smoke. When I am dead and buried, on my tombstone I would like to have it written, “I have arrived.” Because when you feel that you have arrived, you are dead. 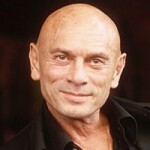 Yul Brynner was a Russian stage and film actor. He was best known for his portrayal of Mongkut, king of Siam, in the Rodgers and Hammerstein musical The King and I, for which he won an Academy Award for Best Actor for the film version; he also played the role more than 4,500 times onstage.